I spent a few hours with Vikki and Nickel’s puppies yesterday. We were trying to decide which puppy would best meet my needs. There are so many things to evaluate! Structure, toy drive, people interest, resilience… and then, whether I want a boy or a girl. I looked through the evaluations and I watched the puppies and then Vikki and I took the top four contenders for a walk around the block, in pairs. She’s a brave woman: we did it with Nickel and two puppies off leash! But her block is very quiet and there’s hardly any traffic, so it’s not as risky as it sounds. I took along a long toy to drag. One puppy stood out for its desire to play with that toy, trotted beautifully, left the other puppy to duck into the bushes to pee, rushed to catch up with Vikki and me… that’s my puppy. Puppy comes home next week! 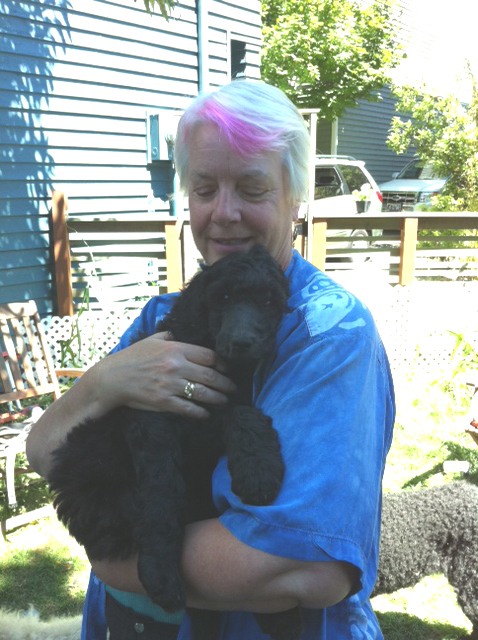 This entry was posted in life with poodles on July 7, 2011 by Diana.